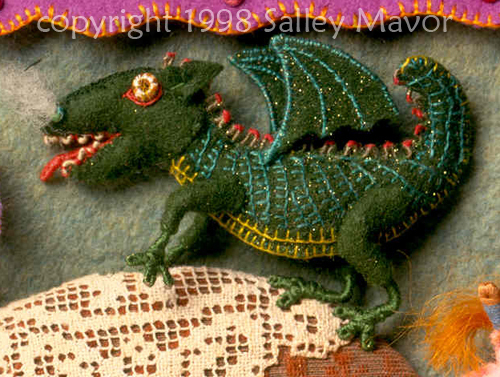 Here are 2 fabric relief pictures that incorporate the story of St. George and the Dragon. These pieces were personal projects and not made for an illustration job or to be published in a book. 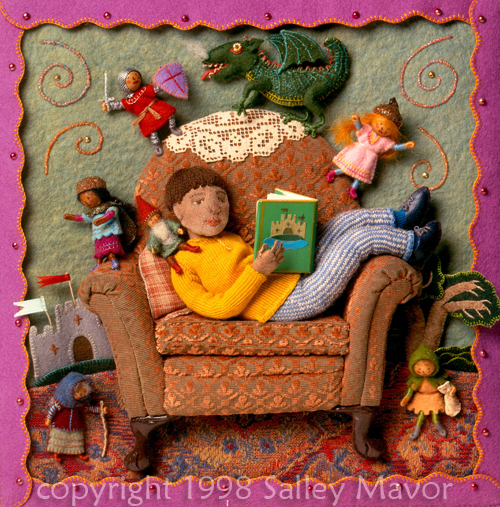 Both “George’s Chair” and “The Storyteller” illustrate the power of the imagination, one through reading a book and the other with storytelling. The chair was made with worn upholstery fabric and sticks out about 1″ from the surface. 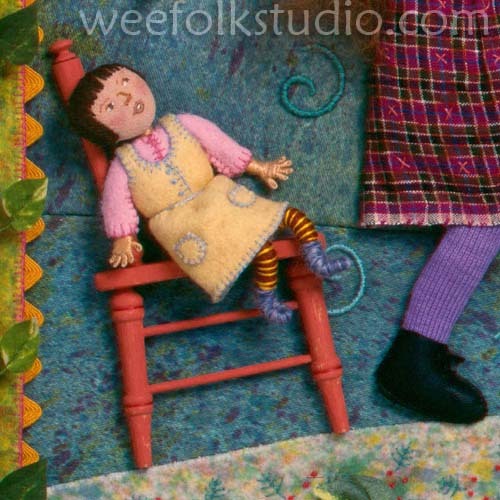 It has a lace doily on top and the chair’s legs are polymer clay. George’s chain mail hood is made from metallic fabric and his arms, legs and sword are wire wrapped with metallic thread. The princess has an acorn cap crown sprayed with gold paint. 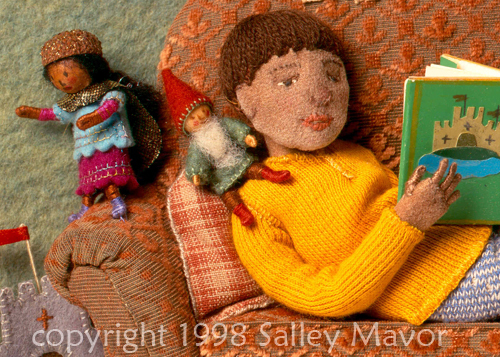 This entry was posted in Animals, Children's Books, Fabric Relief, Felt, Wee Folk by Salley Mavor. Bookmark the permalink. Your Work just amazes me..Your are one talented Lady…Love it all.. So complex on so many levels. Wow! 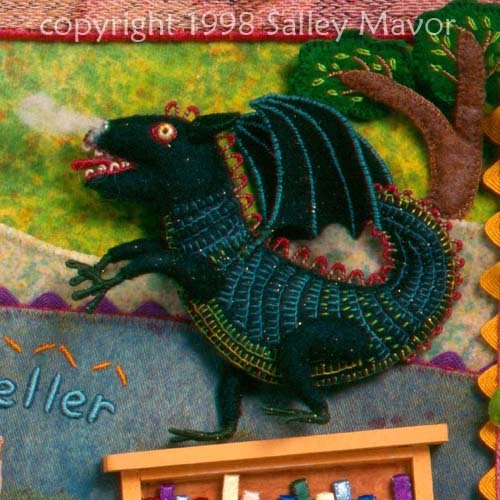 I am in awe of the detail and workmanship involved–not to mention imagination and creativity! There is a lot packed into such small pieces. They are really wonderful! in design and execution warm my heart and touch my soul. fine touches. You are genius. Thank you! I’ve just added a sentence to the post to clarify that that both pictures are not part of a book or illustration job. They were made purely for my own enjoyment. In the future I want to do more work like this, that is personal and stands on its own. Every post is amazing. So glad you are here. I love your book. 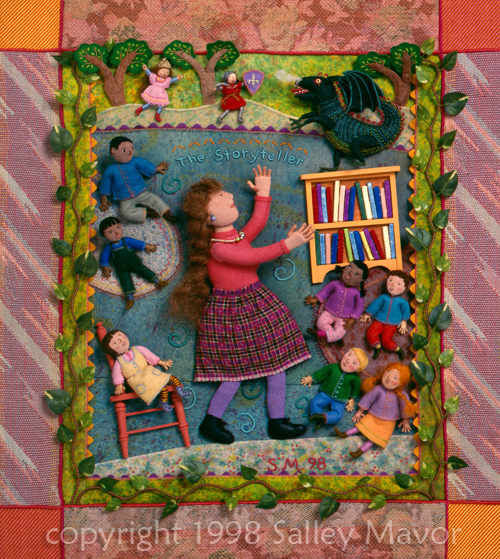 I just bought it and am going to try to make the wee folk and would love to make a wall hanging. Love your work. So glad you have a blog I can follow. Wow, Salley — your detail always amazes me, but somehow these seemed exceptional. Thanks for sharing. I’d be curious to know how much you stitch and how much you glue when assembling your pieces? Glue? I stay away from the stuff. Too messy for me. I only use glue to build wooden structures or to hold a stone in place. If it can be sewn down, I use thread. Even wood pieces are sewn through drilled holes. It doesn’t feel right unless I use a needle and thread! A friend sent me your link. I just love these works of art. 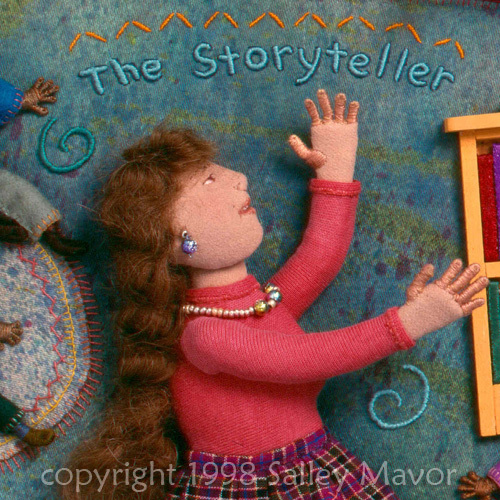 I am a storyteller of young children and I feel you have captured the spirit of many a storytelling program with young children. You have a great talent.